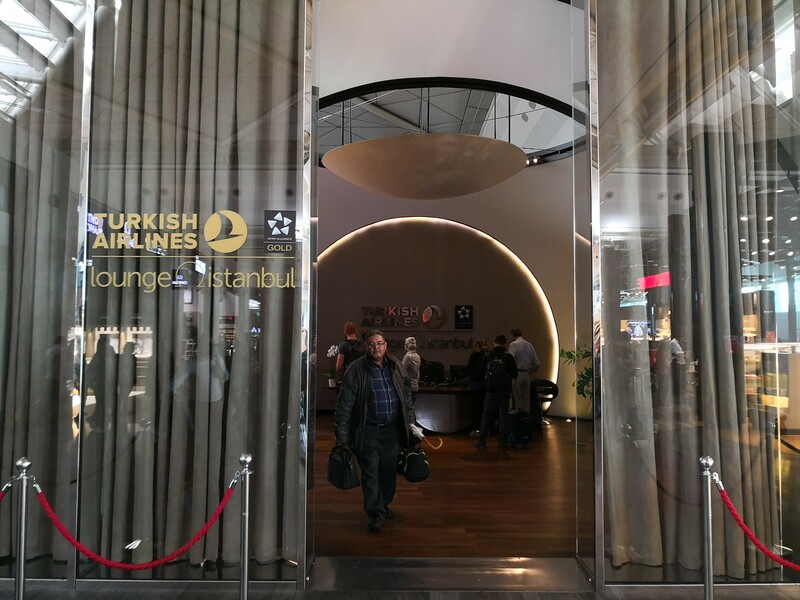 Star Alliance Gold and Business class flyers have long raved about the large Turkish Airlines lounge at Istanbul Atatürk Airport. 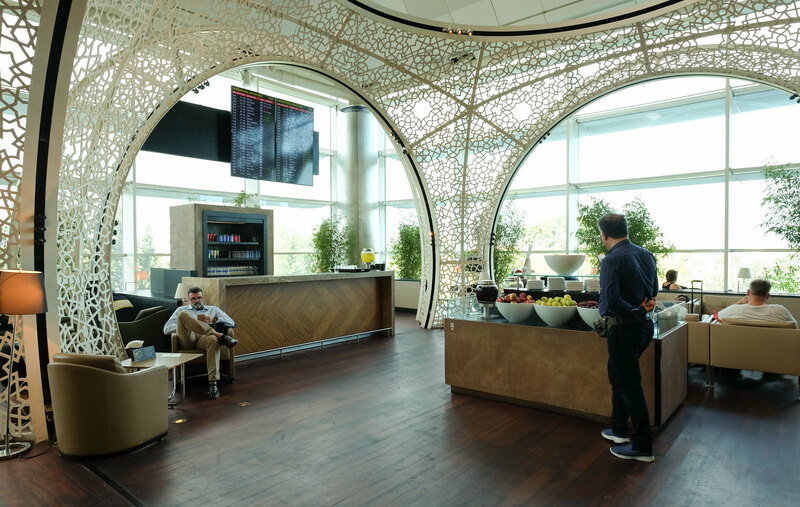 Considering Turkish Airline has moved to a grand new airport, I would write about the lounge as a way for readers to reminisce about the numerous transits they might have in the place. 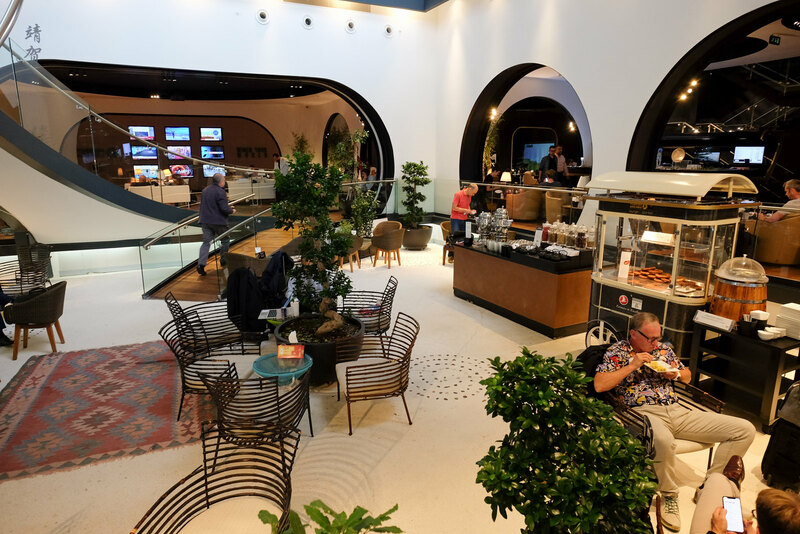 Most guests enter this lounge on their transit from the departure concourse next to a Starbucks coffee outlet located on the left side after passing security. 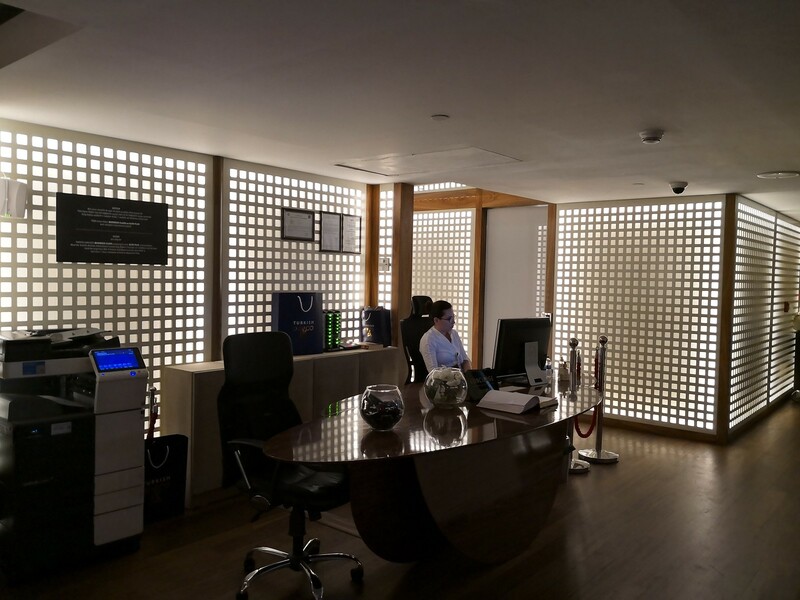 Past the entrance, there is a reception desk with staff on hand to assist guests. However most passengers could just scan their boarding pass to gain entry through the automated gates that they have installed. 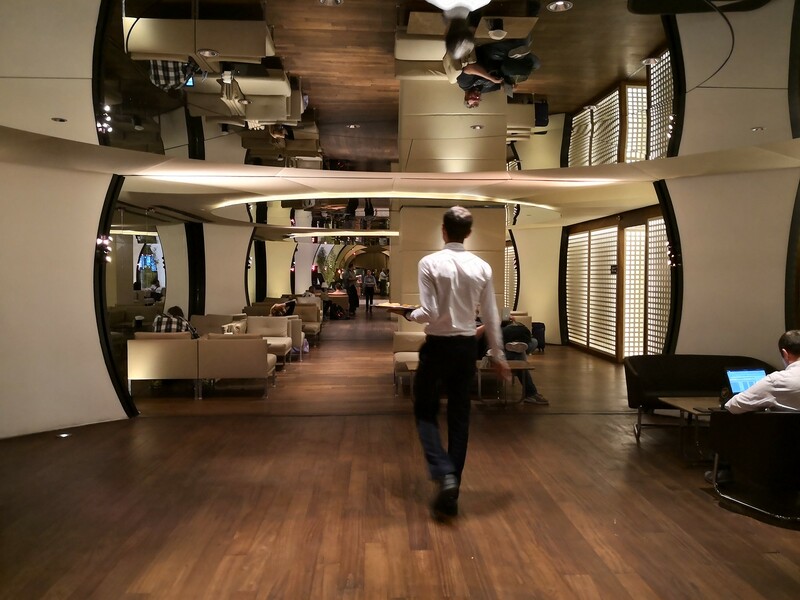 The new Turkish Airlines lounge in the new Istanbul airport would have the same access. 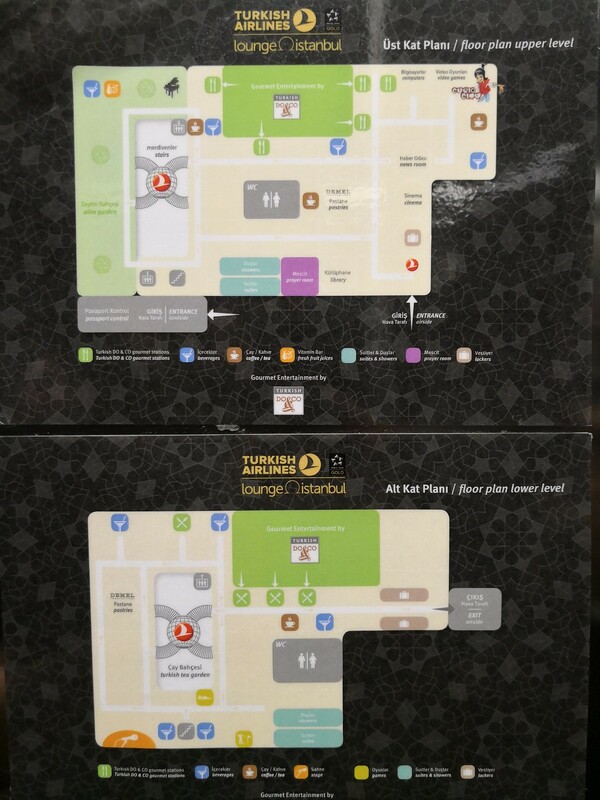 Turkish Airlines lounge was spread over 2 floors and the layout of the lounge is shown in the plan below. I would be referring to this floor plan as I guide you along my review of this lounge. 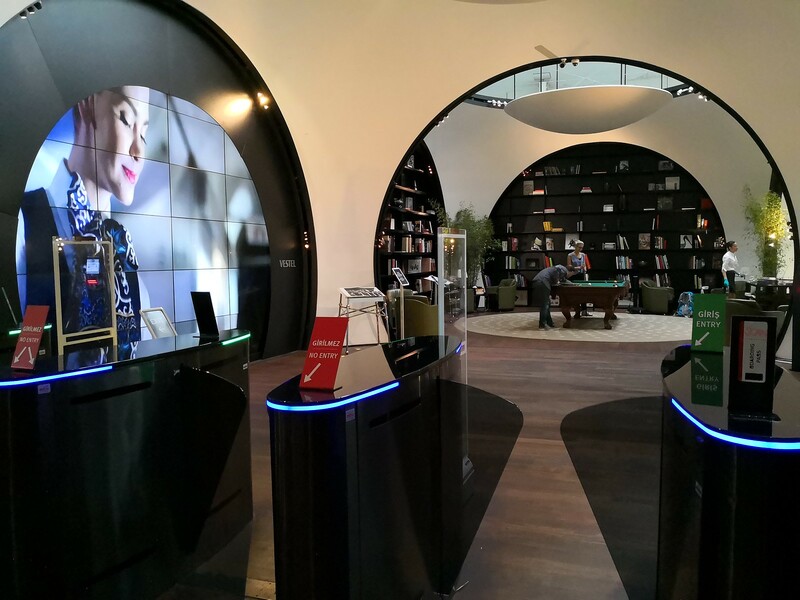 The first thing most guests notice would be the magnificent library with a billiard table in the center of it all. 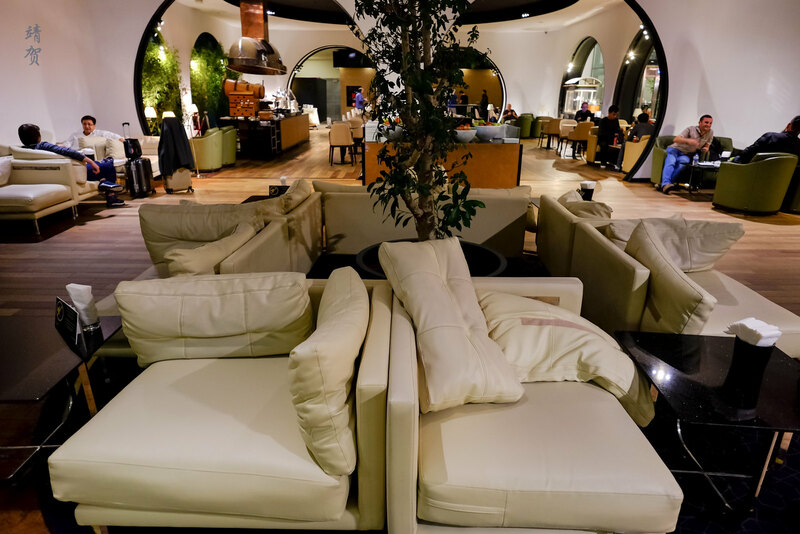 This beautiful structure creates a good first impression on most travelers using the lounge. 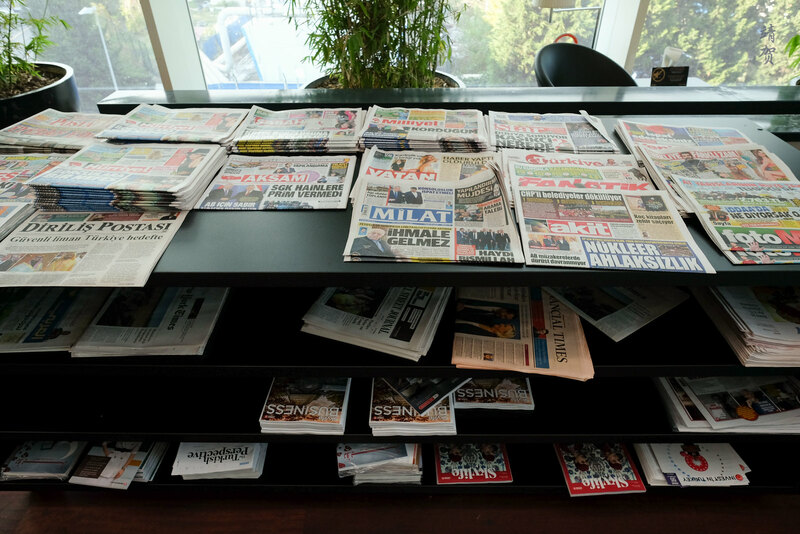 A newspaper and magazine trolley can also be found beside the library structure but there are more shelves containing reading materials throughout the lounge. Behind the reception desk, there is several rows of luggage lockers, all in transparent plastic shelving which I believe is to ensure there are no contraband or even worse incendiary devices. 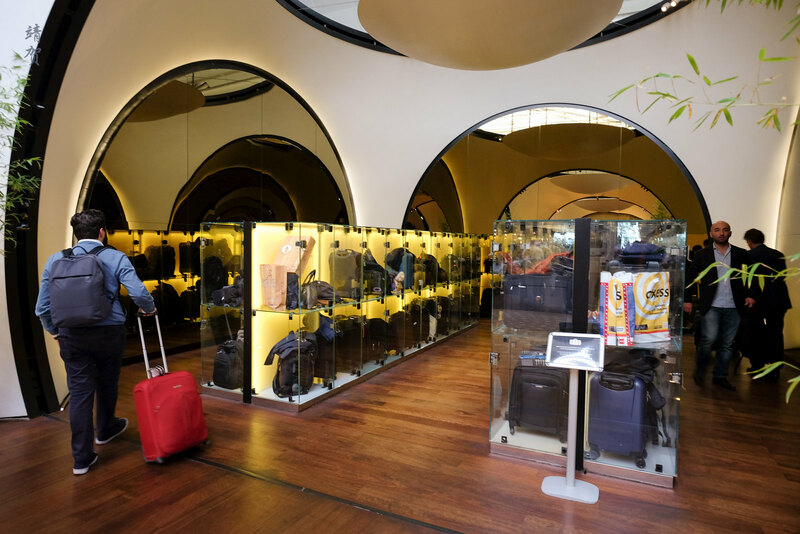 As the lounge is split into 2 floors, there is another luggage lockers at the lower level. 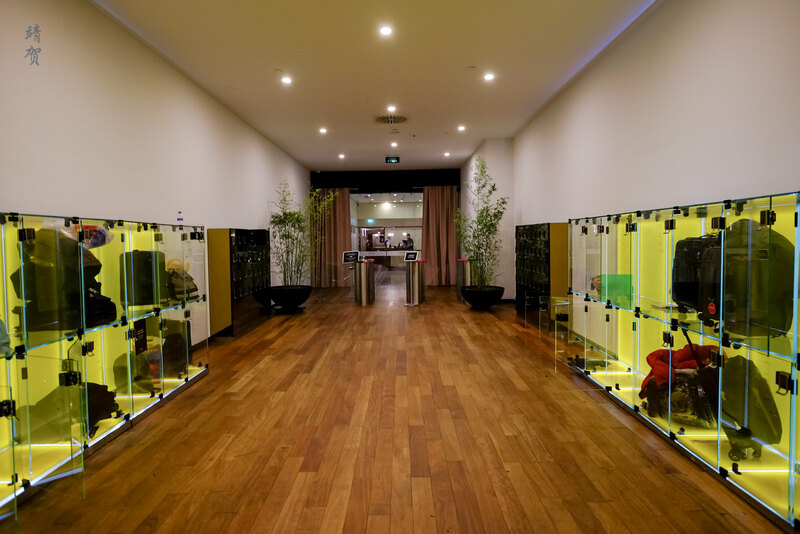 Turning right from the entrance will lead to a wide corridor leading to the rest of the lounge. There is a section specially darkened to be a movie theatre with reclining armchairs complete with legrests. 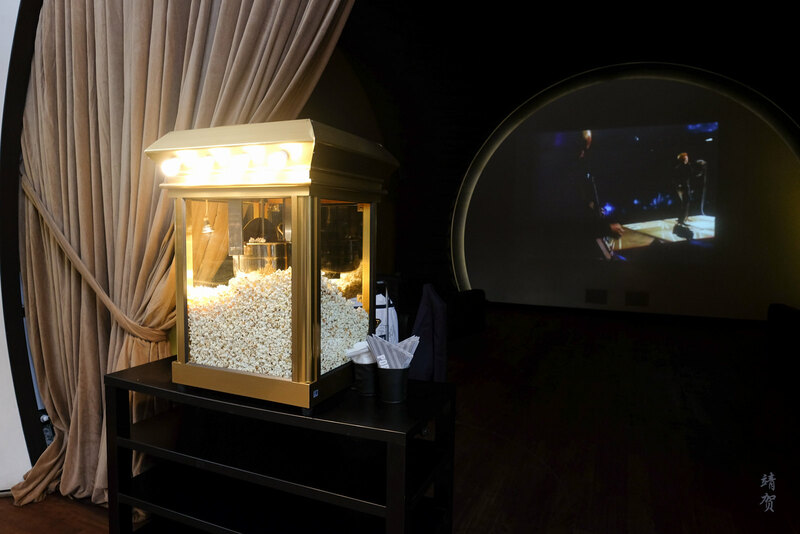 There is even a popcorn maching outside this section to complete the ambience. 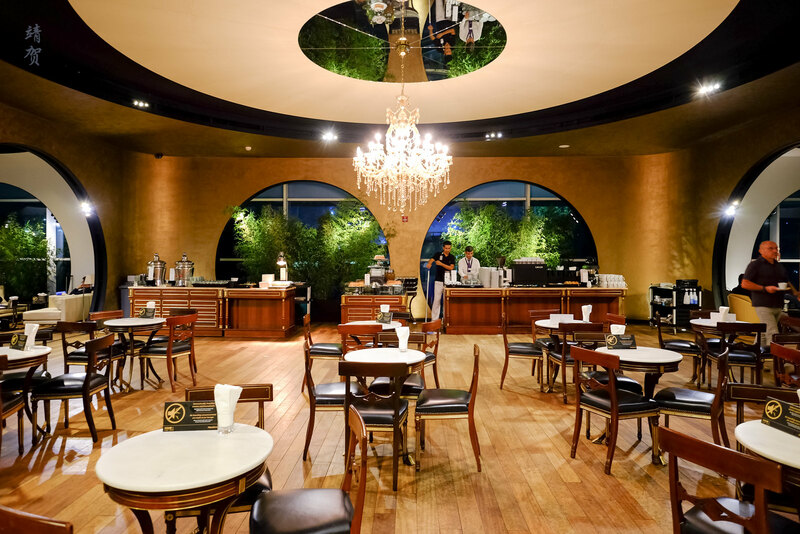 Across from the mini cinema, there is a cafe setup meant for guests with shorter transit. 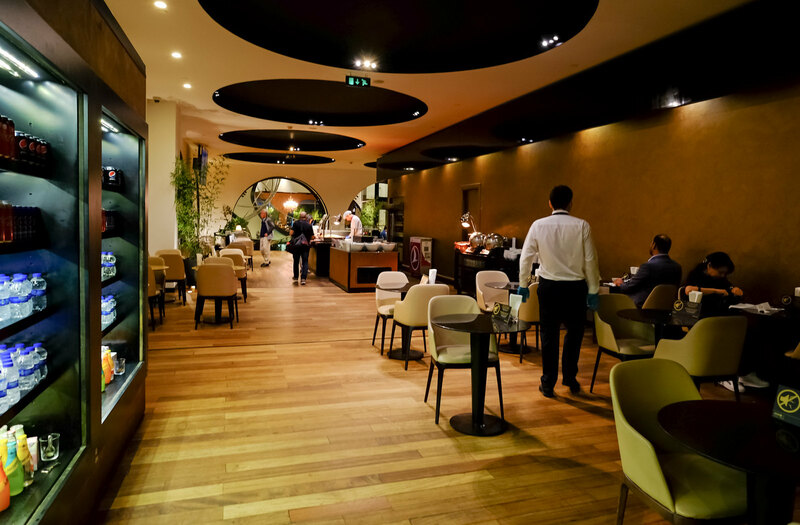 Furnished with wooden furnitures to resemble a Turkish cafe, this space was beautifully designed. 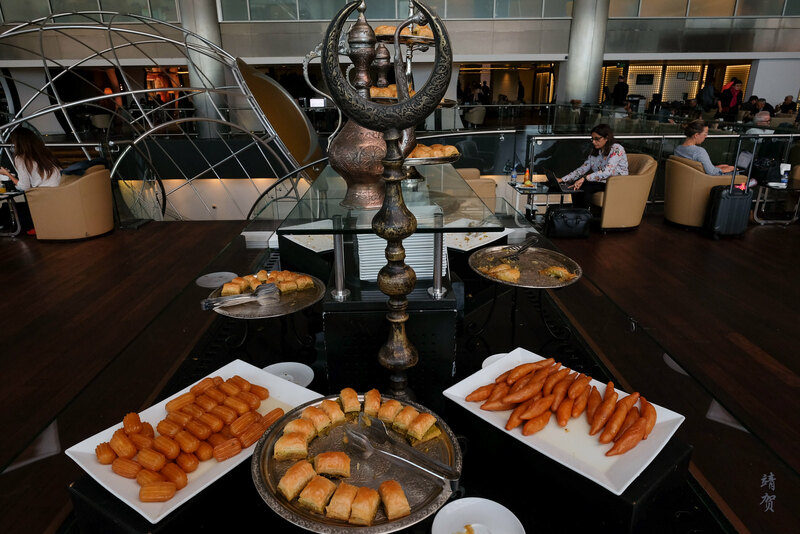 Guests could request specialty coffees from the staff or pour their own Turkish coffee and tea. 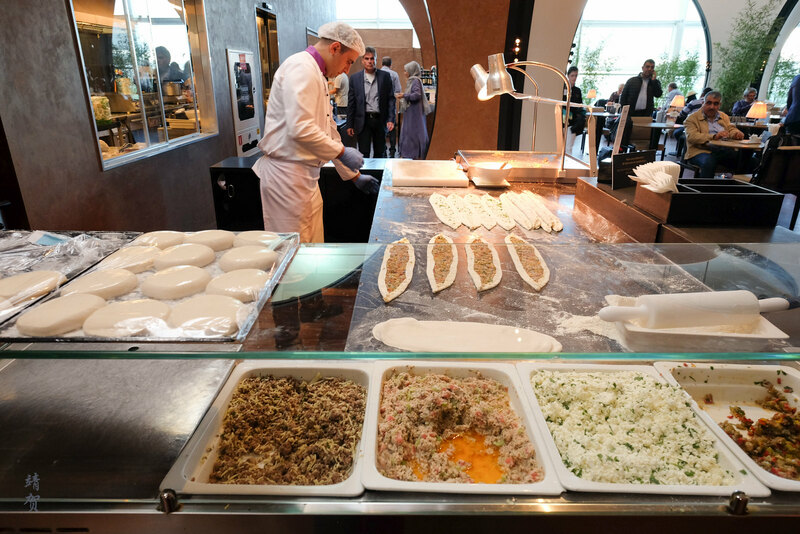 Across from the cafe there was an open baking station which features Turkish flatbread or pide. These flatbread makes enjoyable snacks as there are several filling types ranging from beef, turkey, vegetables or cheese. 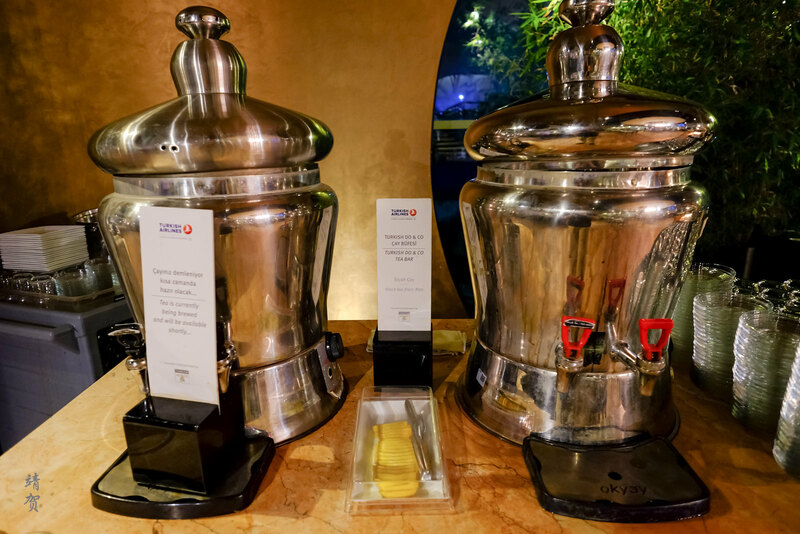 On the buffet console there was 2 pots of soup with choices being mushroom or lentil soup. 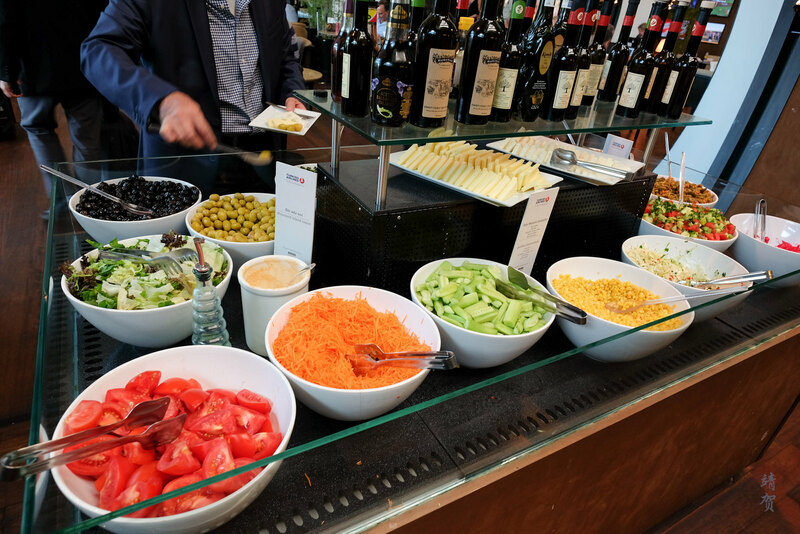 In a separate island console, there was a salad bar with plenty of fresh vegetables to choose from, including olives. Various dressings, cheeses and balsamic vinegar was offered as condiments and toppings too. 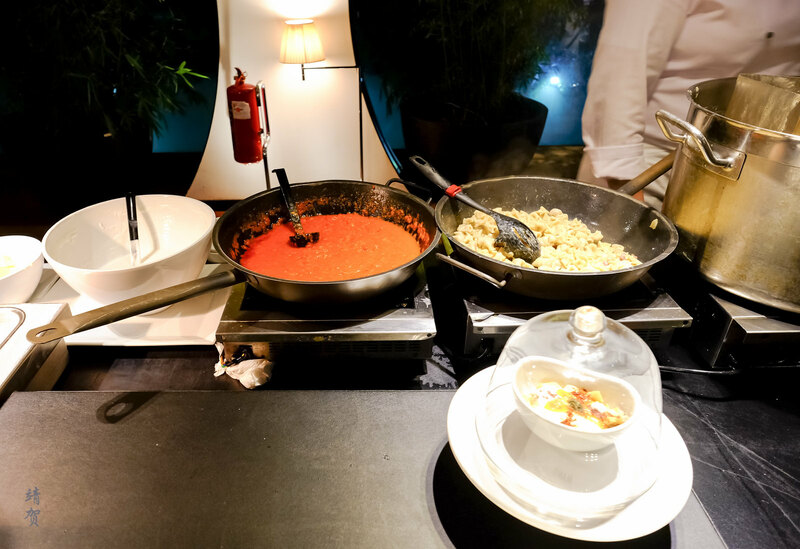 From the nearby kitchen, there was a pasta of the day and a vegetarian stir-fry noodle to choose from as the main course. All of this is part of Do & Co gourmet entertainment. 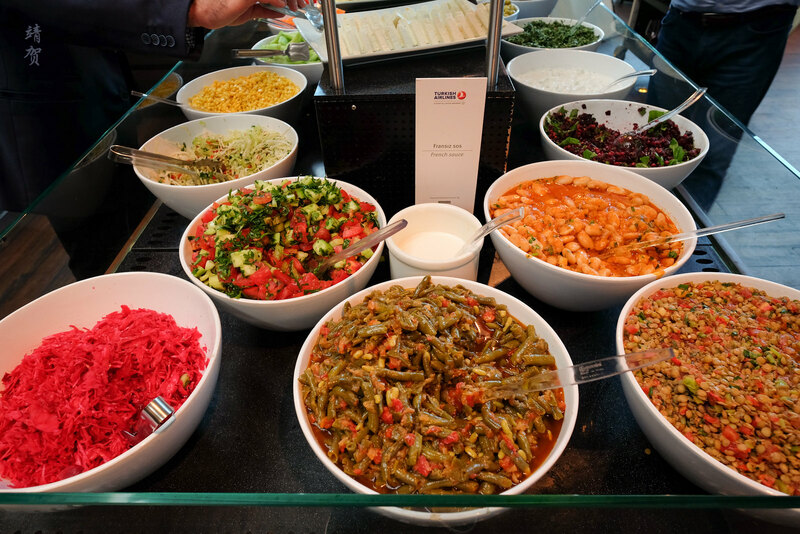 Do & Co is also Turkish Airlines’ inflight caterer. Next to the kitchen and buffet, there was a large dining area. The furniture here is different from the one in the cafe and seems more comfortable when seated for a longer time. 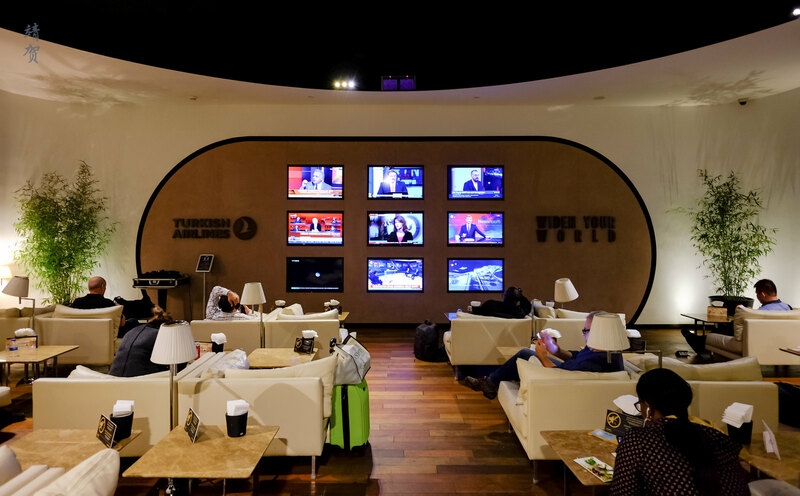 Adjoining the dining area was a large lounge area with seats facing a wall of TVs that was tuned to the news. 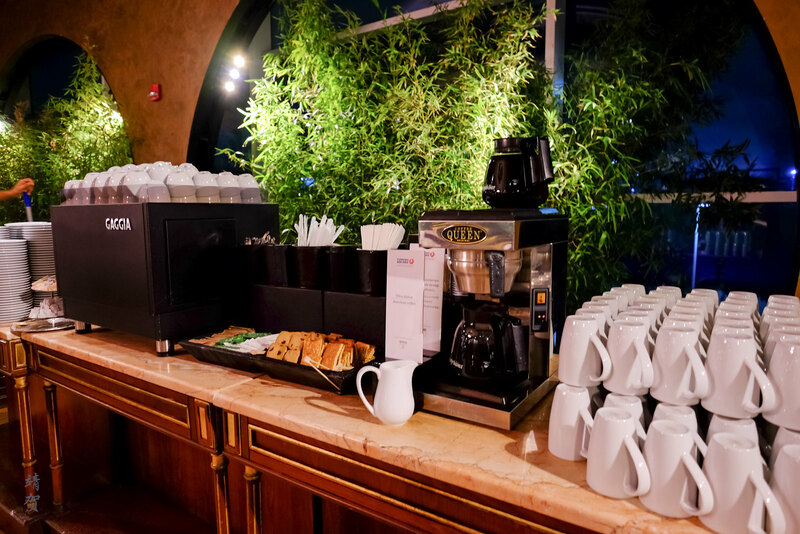 There was another coffee and tea station in this section of the lounge. 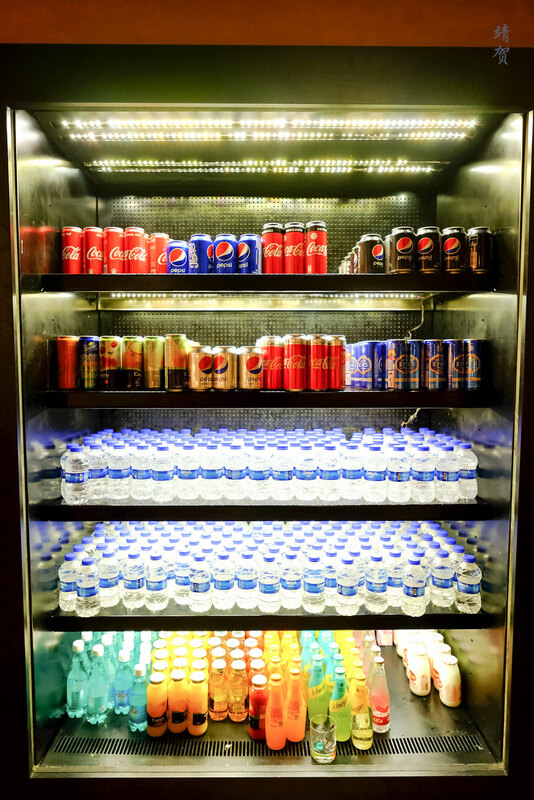 At the end of the lounge there was a beverage station with plenty of soft drinks and bottled water to choose from. 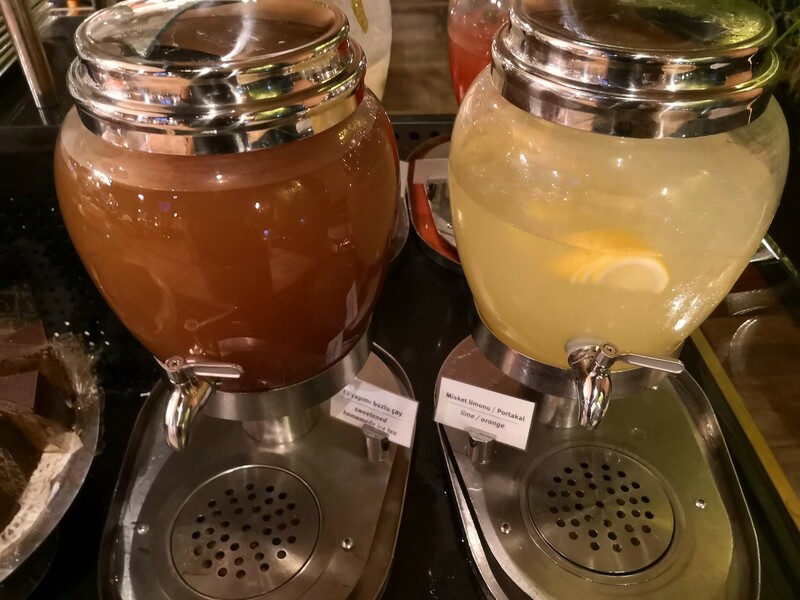 The same beverage station can be found in the other areas of this large lounge. There was a children’s play area that was located at the end of the main floor so this does ensure families with kids get their own space to hang out in. 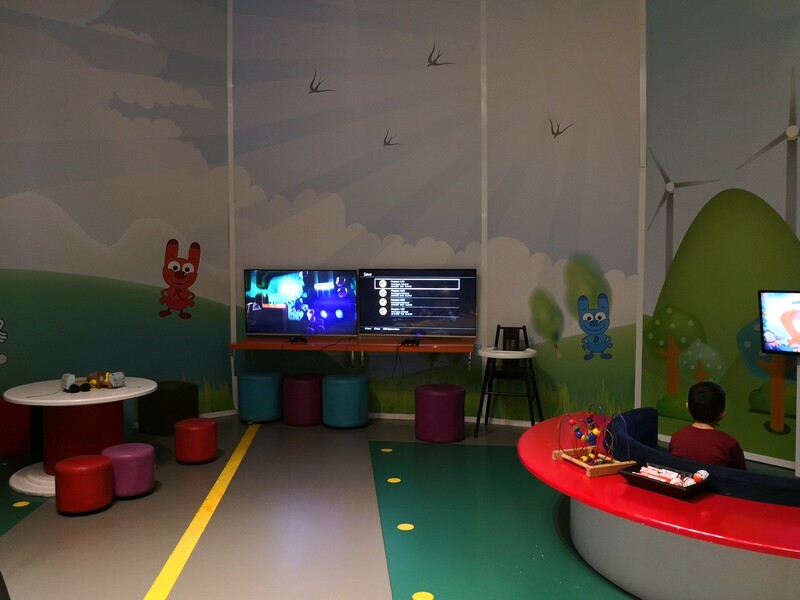 The area has small colourful stools with some toys and their own video games consoles and TV showing cartoons to occupy the children. Thus far we have just covered one half of the lounge on the main floor. From this section of the lounge there was 2 hallway that connects to the other side where there would be more natural light. One of the hallway was beside the kitchen and there was another window that was serving seasonal dishes. 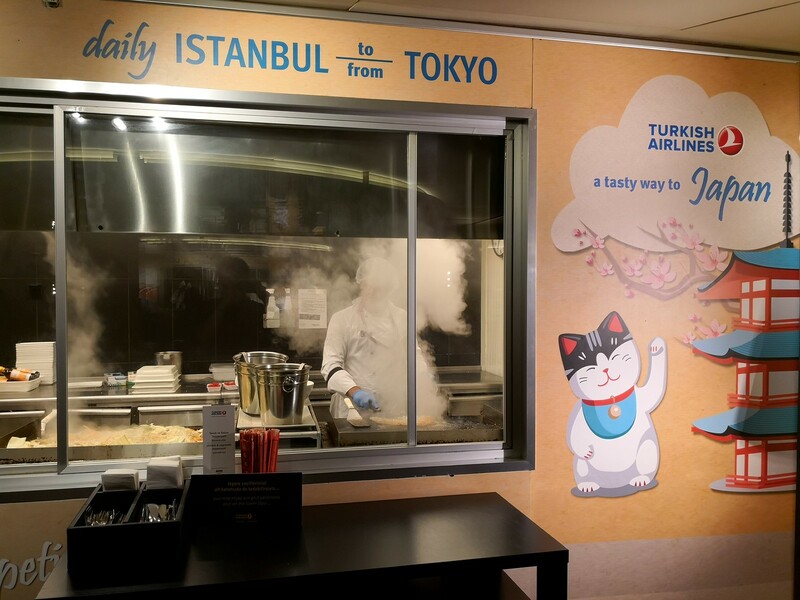 On my visit it was serving Japanese dishes to celebrate Turkish Airlines’ flight to Tokyo. 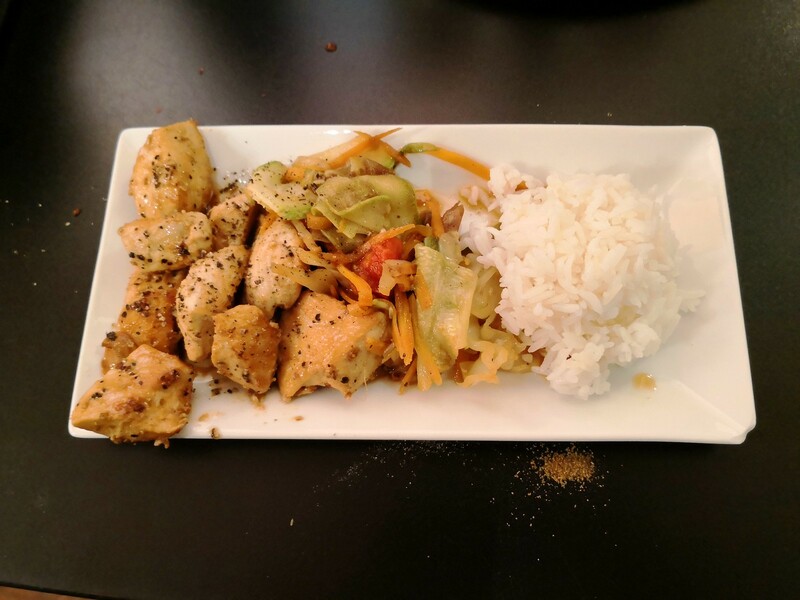 Chicken and vegetable teppanyaki with steamed rice was being served. Another parallel connecting hallway nearer the lounge entrance has more cozy seating spaces due to the lower ceiling in the hallway. A customer service desk is located at the end of the connecting hallway in the main floor, though there is another service desk in the lower level. Guests can ask for a token to reserve a shower room though if one only has one hour in the lounge, the wait was long at times. For my first visit, even after a 30 minute wait, I still could not get a shower room. 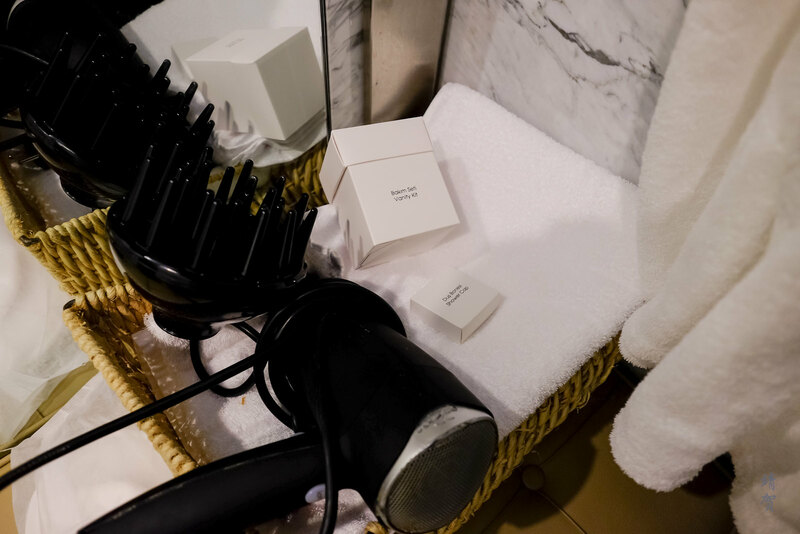 Guests have to exchange their boarding pass for one of these tokens so it is not possible to double-reserve the shower rooms in the main or lower levels. Next to the customer service desk, there was a row of Macintosh workstations for guests who need a computer to access the internet. 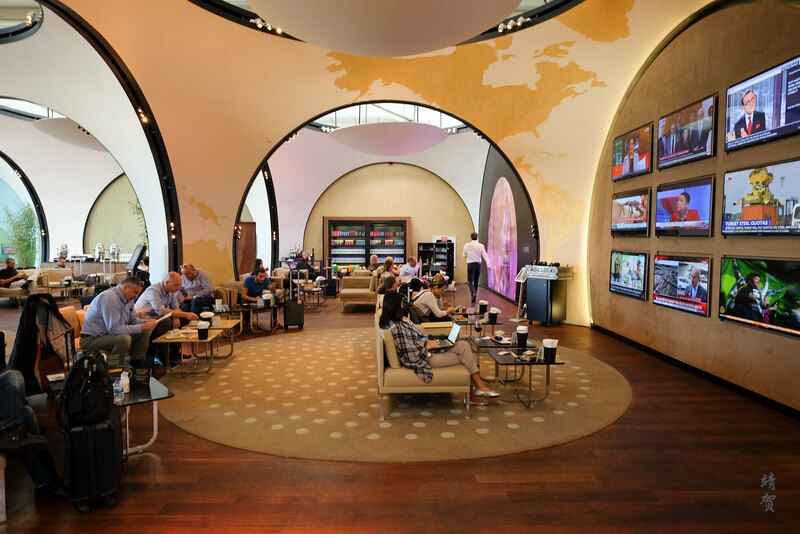 Otherwise guests could scan their boarding pass for a wifi passcode at one of the numerous kiosks spread over the lounge. 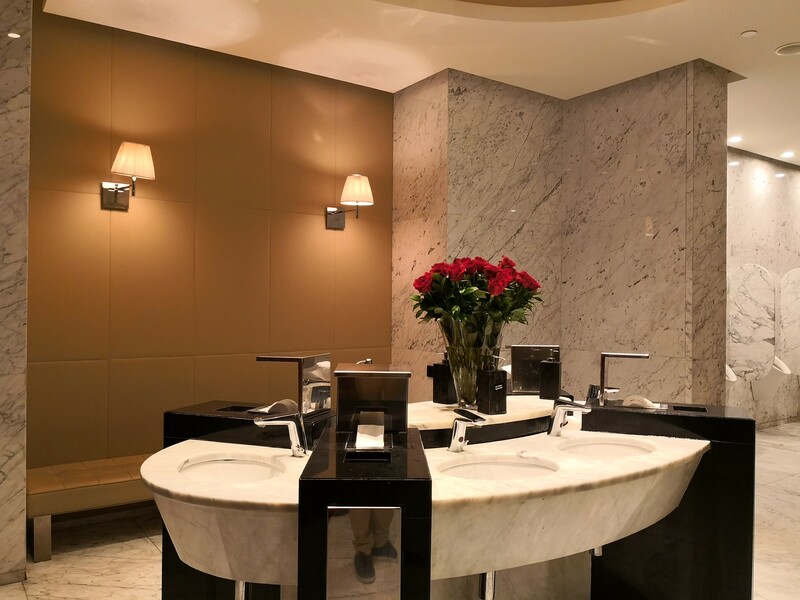 In the middle of the lounge, there was the male and female restrooms and they were very nicely decorated inside as well with an island containing several sinks by the entrance and private cubicles for the men’s toilet. 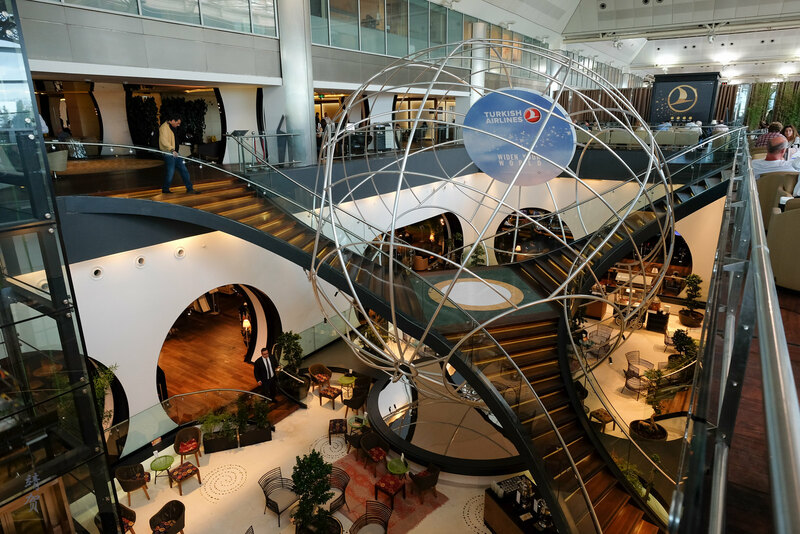 The other side of the lounge on the main floor comprises mainly of lounge chairs with a central atrium whose main highlight is the ‘globe’ staircase. This section is also the ‘green’ section labelled as the ‘Olive Garden’ in the floor plan. It is just a dramatic globe shell over an ornate staircase leading to the ground floor. 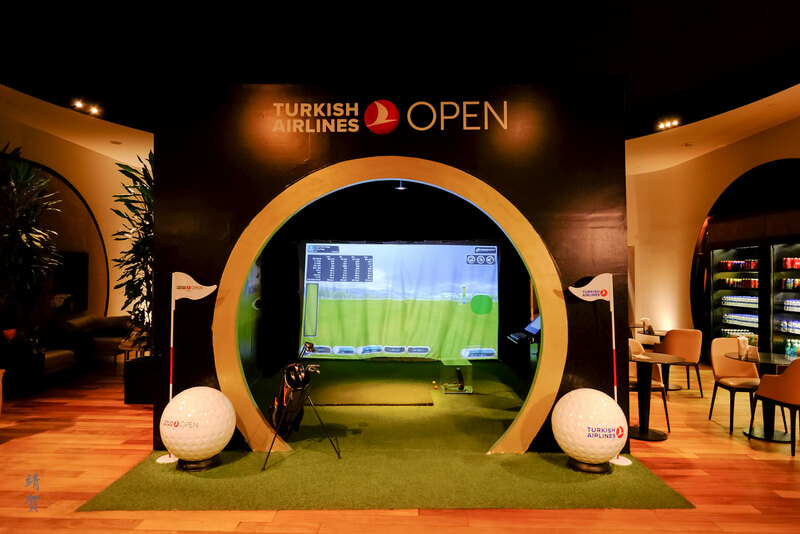 The showcase has Turkish Airlines’ branding in gold and has the ‘wow’ factor for first time guests. 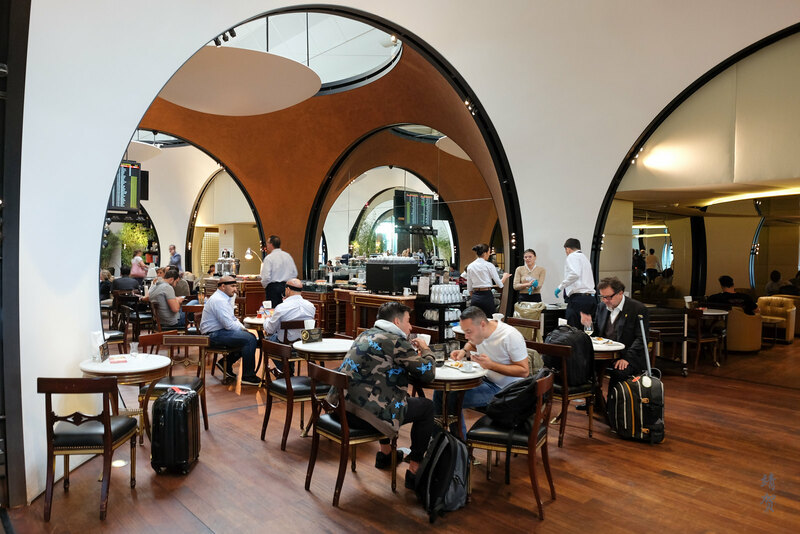 Armchairs are lined around the atrium for single and couple travelers while there are more square leather L-shaped armchairs inside. 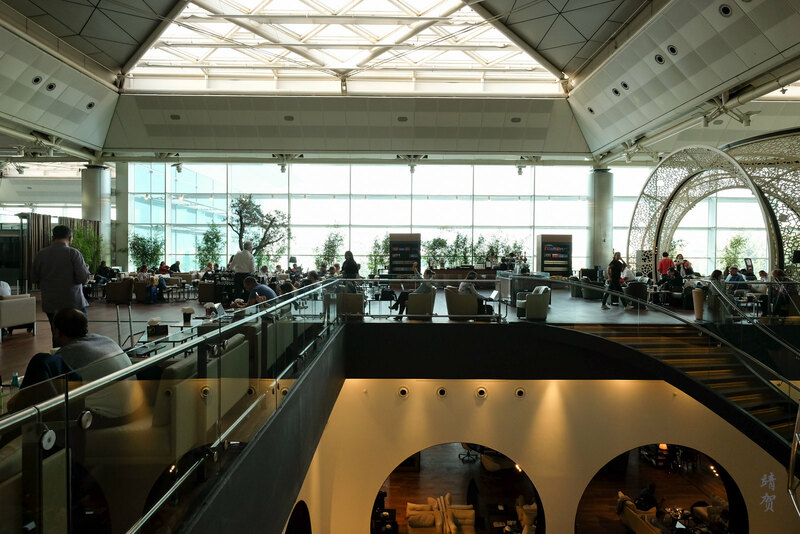 This section of the lounge is the nicest in the day as it receives natural light from the large windows of the airport terminal. 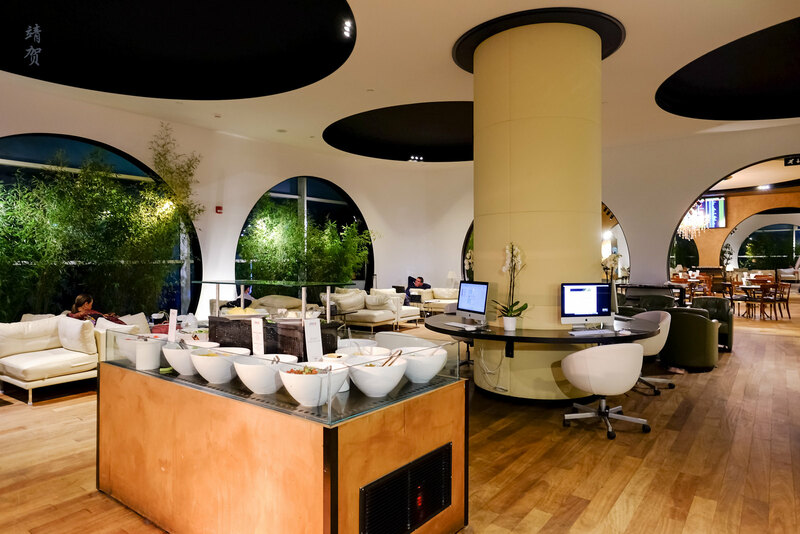 While this was designated more as a relaxing space for guests to work, read or just surf the net while waiting for their next flight, Turkish Airlines made sure there was always some food and drinks nearby. 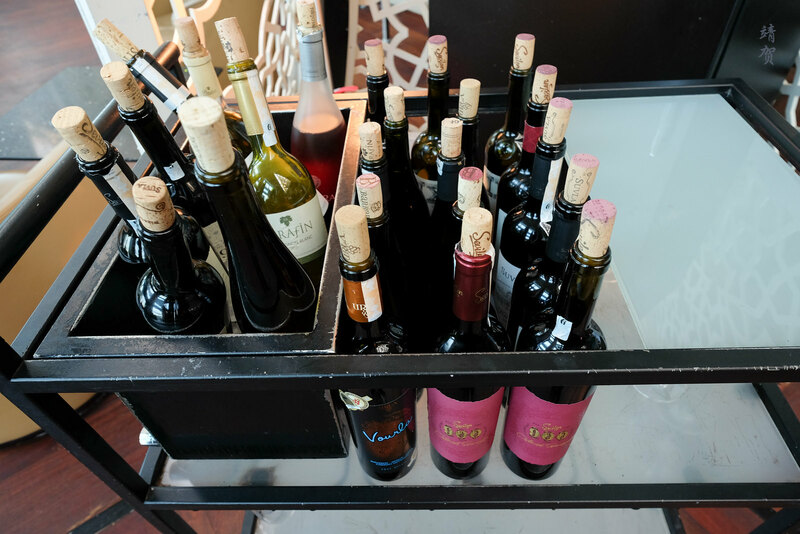 There was wine from the cart, for example. 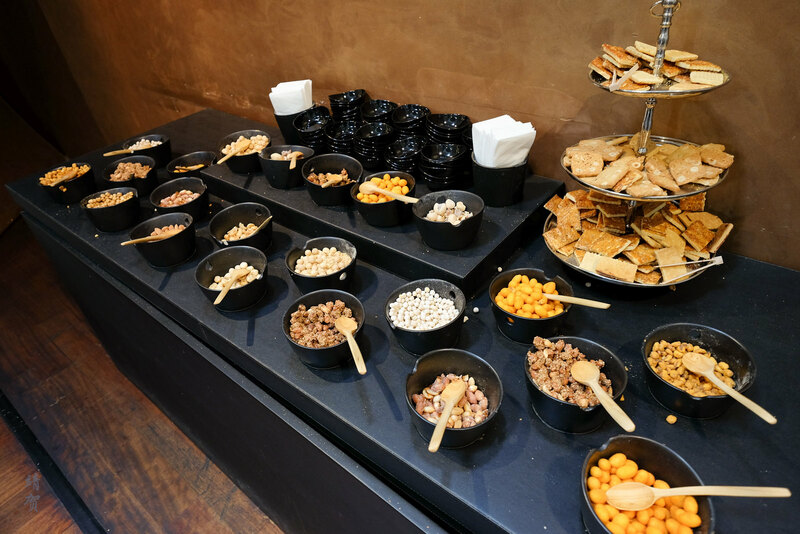 Another buffet island has one of the widest varieties of marinated olives and since they mention it is a nod to Turkish cuisine, I found it to be a nice touch. After all an airline is meant to connect people to the fascinating cultures and way of life around the world. 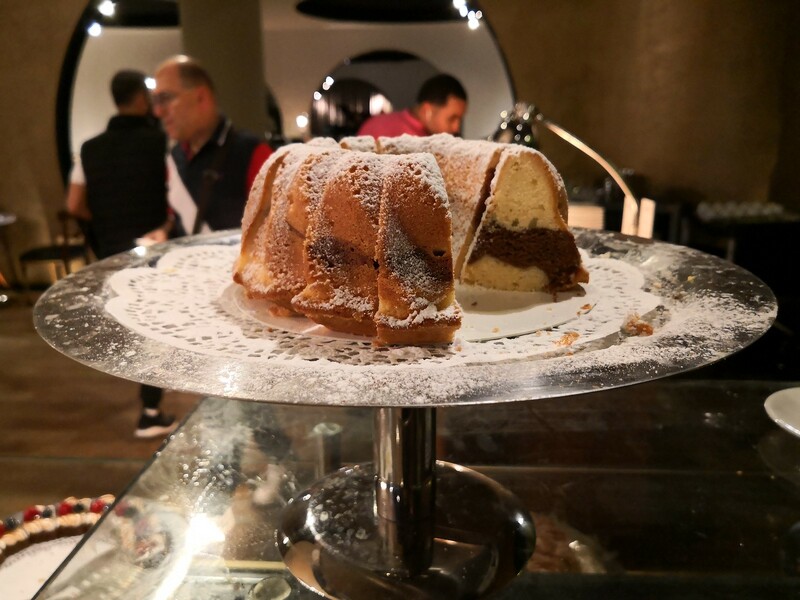 Another of the island features yet another Turkish specialty. This time it was desserts with baklavas being one of the choice. 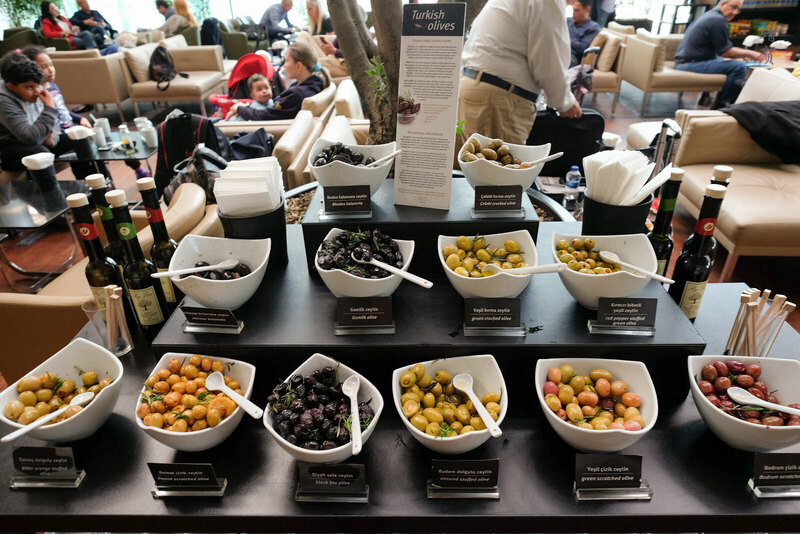 Generally the same kind that gets served onboard the flight so if you like it, you know where to get more for yourself! 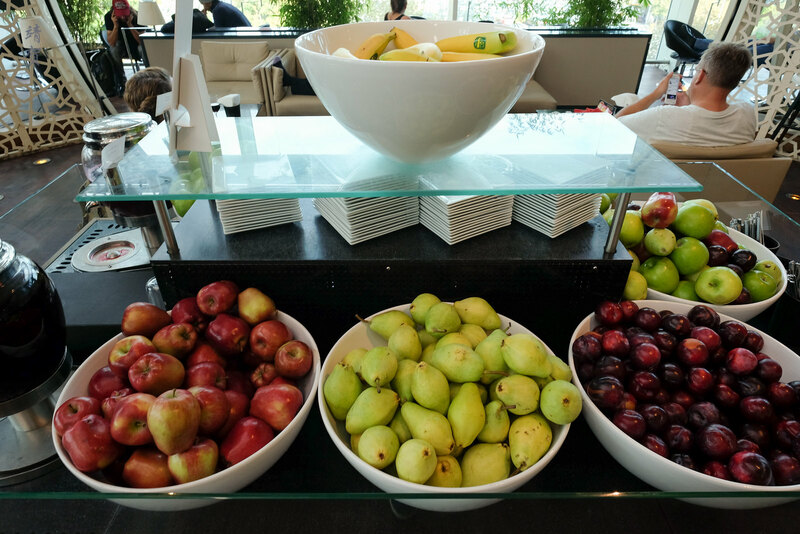 At the corner of the lounge there was a fruits bar with fresh apples, pears and bananas alongside some juice dispensers. 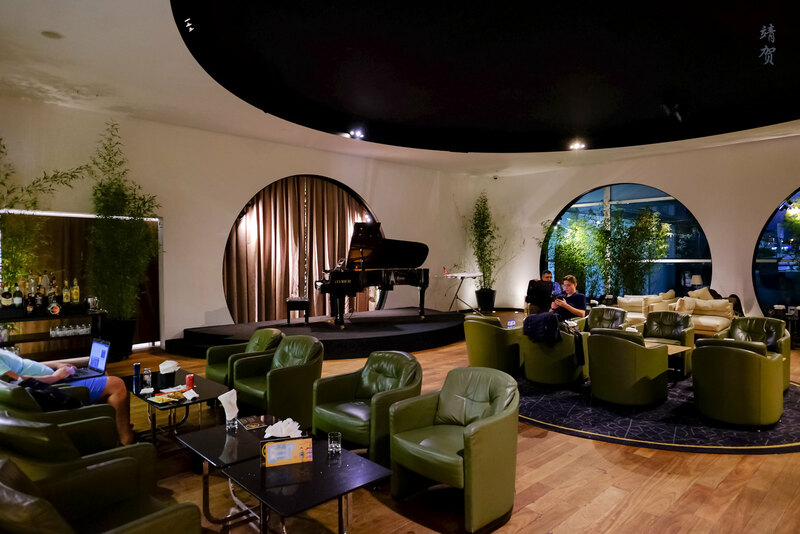 This corner section of the lounge also has its own self-serve beverage fridge along with a grand piano on display. 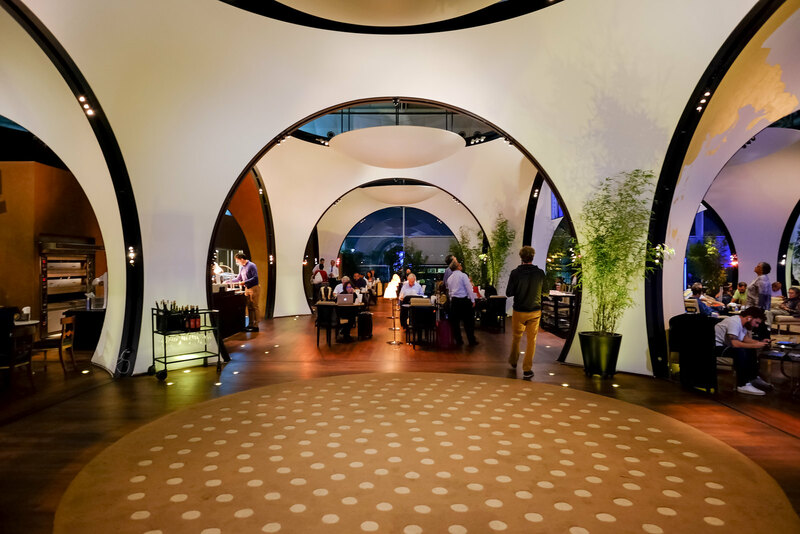 An elevator can also be found for guests heading down to the lower level of the lounge. 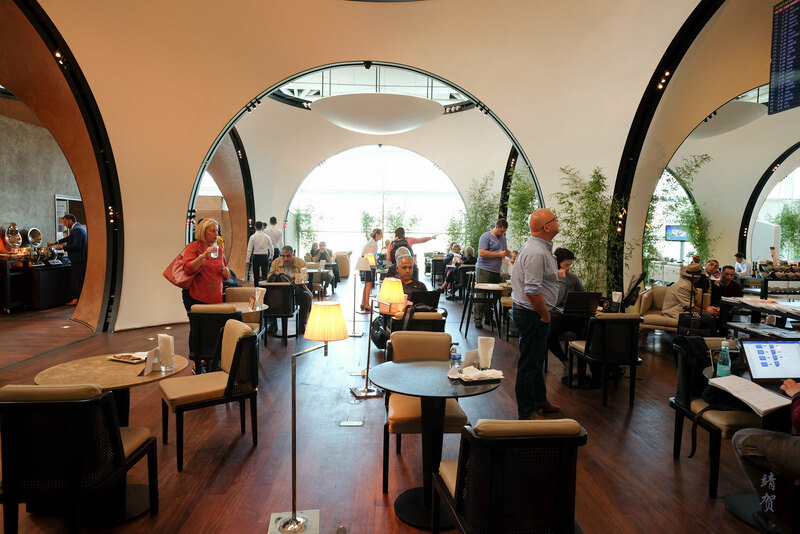 Normally I would say just the main floor of the lounge was adequate as far as most airline lounges go. But Turkish Airline definitely went the extra mile to ensure there was enough space for guests to stretch out and have their own space, so there was a whole floor having as much space as this below it. Accessible via stairs or elevators on the corners, the lower part of the atrium has seating that resembles that in a Turkish courtyard or plaza with snack stands placed around it. 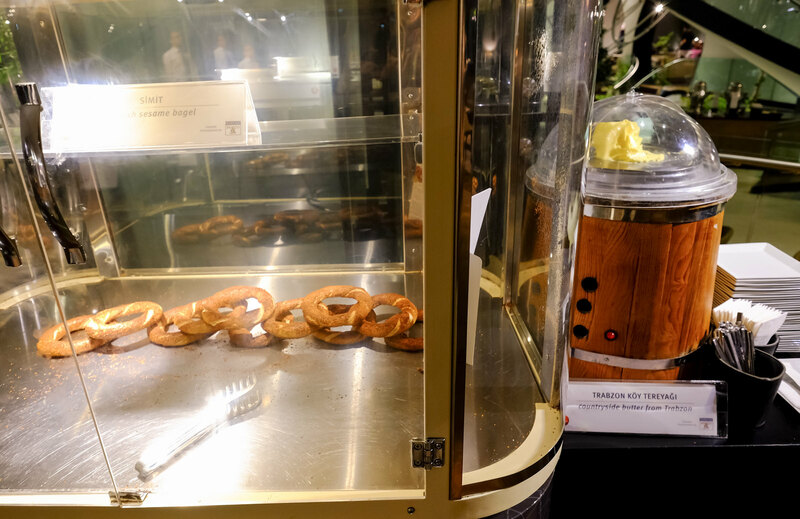 Some of the snack stands around the atrium was serving more local delicacies like sesame bagels and countryside butter. Starting from the lower left corner of the lounge as seen from the layout at the start of this review, there was another grand piano set in the stage with the seating around it to create an ambience of a music lounge. There might have been evening performances here to entertain the guests. 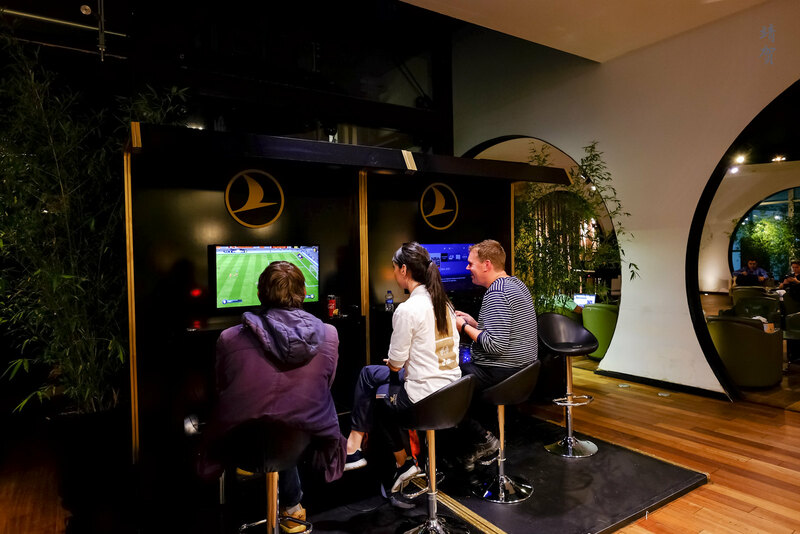 Next to the piano bar was a video game station with several consoles set for multi-player games. 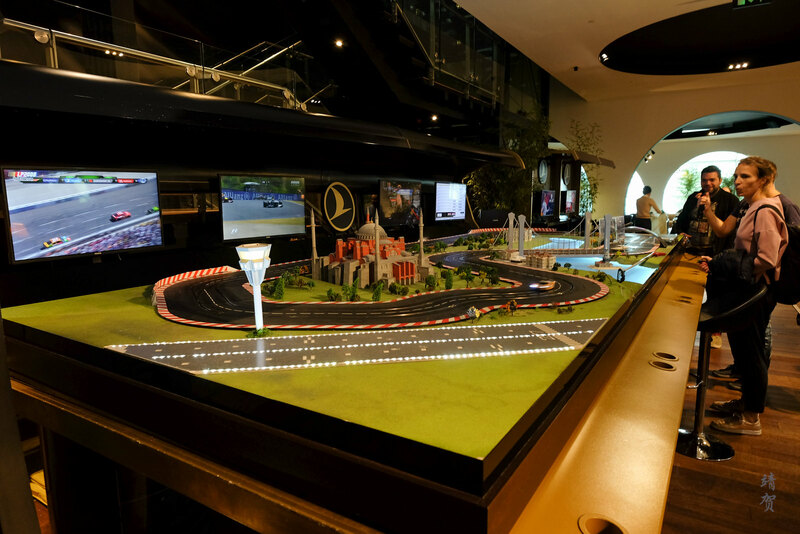 Then there was a large RC model racetrack for adults to have some competition in. This was definitely impressive and sure would appeal for many young adult travelers. And next to it was a Golf simulator so one can catch up on their moves while traveling. 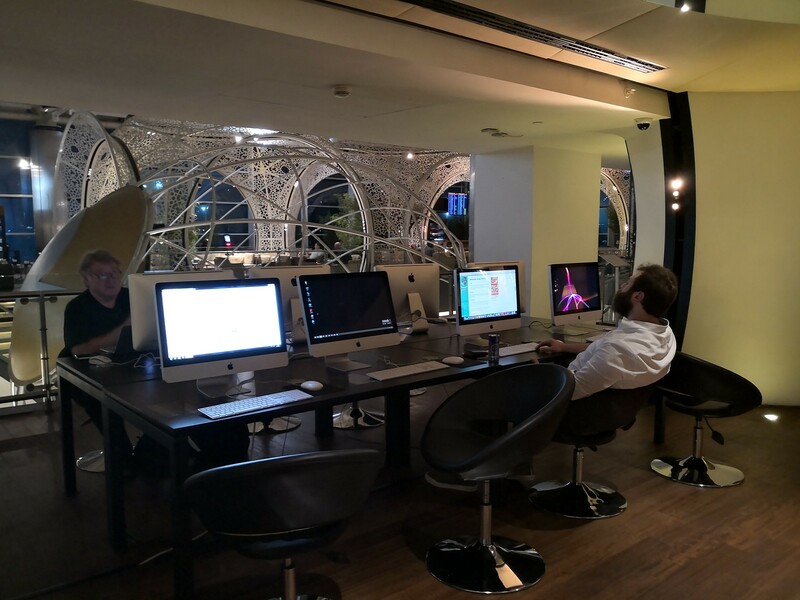 So the lower floor does have some interesting facilities uncommon in other more basic airport lounges! Further to the lower right side of the lounge according to the layout was the second concierge desk where guests could gain access to some nap rooms, though these were restricted to Turkish Airlines Business Class passengers and Elite Plus cardholders, and guests have to have a transit of more than 4 hours and less than 7 hours. 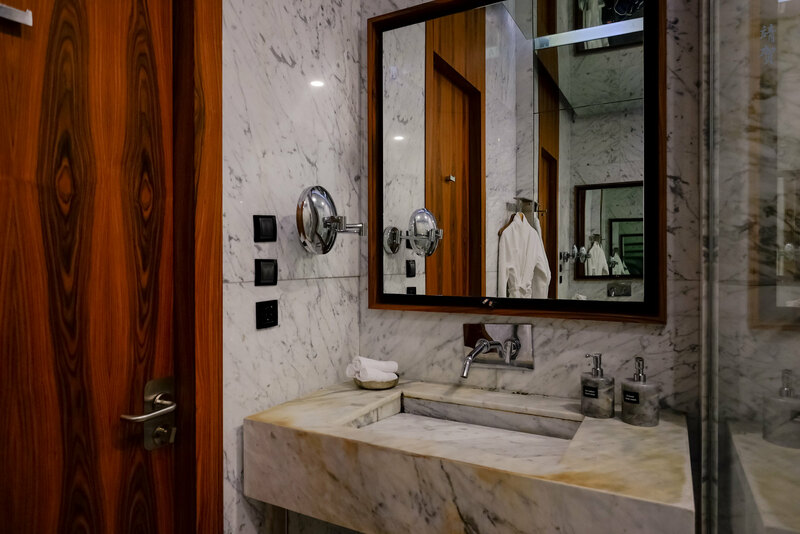 Shower rooms were also available from the desk in the lower floor. 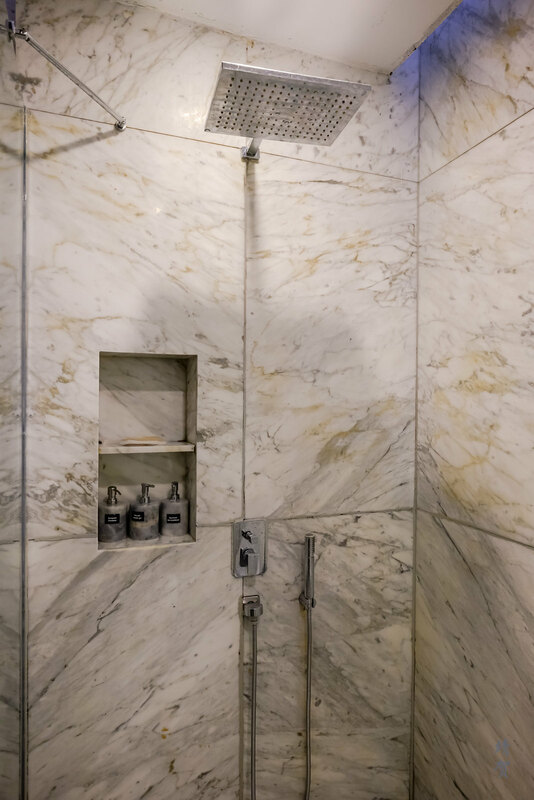 The private shower rooms were nicely fitted out even though the white marble finishings were showing signs of age. It also had some yellow stains that did not make the area feel well cleaned or maintained. 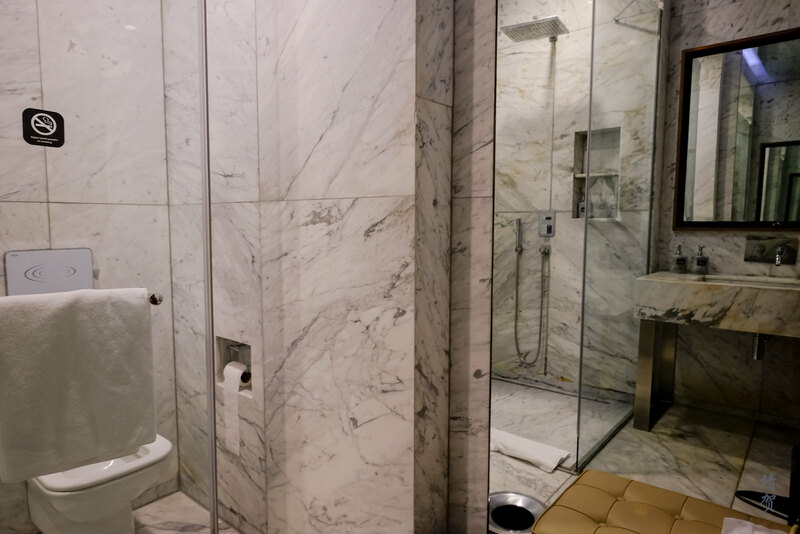 However there was a private toilet inside alongside a full shower cubicle with both a hand-held and rain-shower head. 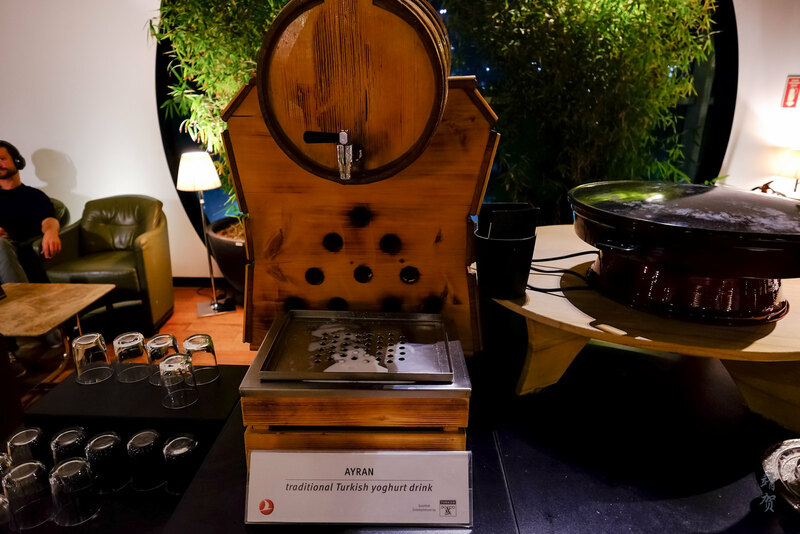 Amenities were provided in large containers but there was fresh towels, a loofah and a bathrobe inside. Other amenities like a vanity kit, shower cap and hair dryer can be found by the basket on the countertop. There was even a nice leather bench to place your luggage. As such this was one of the better lounge bathrooms I have been to. 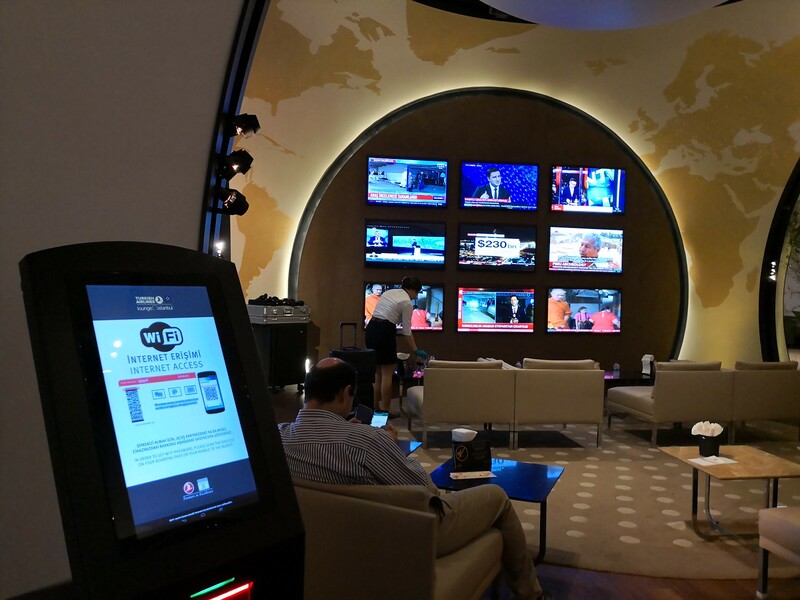 Beside the concierge desk was yet another large wall furnished with multiple TV screens tuned to the news and the seats here have been aligned to face the TV but the unique armchairs Turkish Airlines uses means guests could also face perpendicular to avoid looking at the TV. 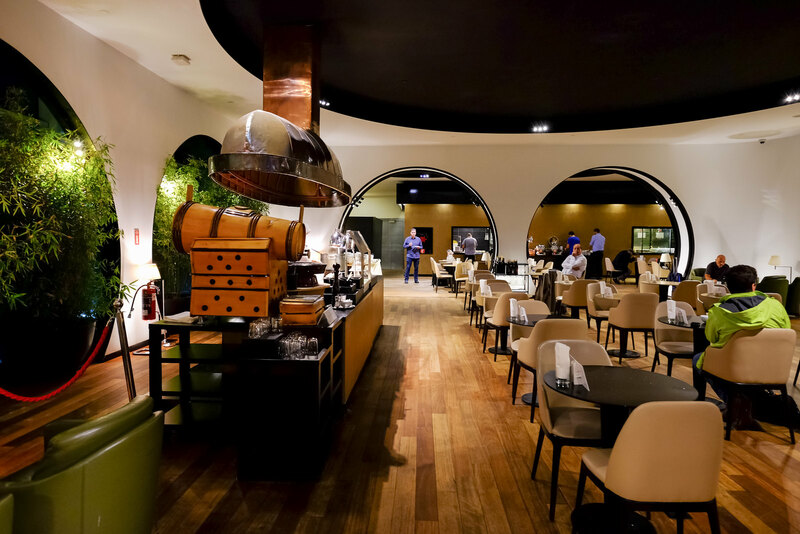 The next section of the lounge at the lower floor coincides with the kitchen on the main floor. This space was used as a kitchen as well and there was a different kind of dish being whipped up here. 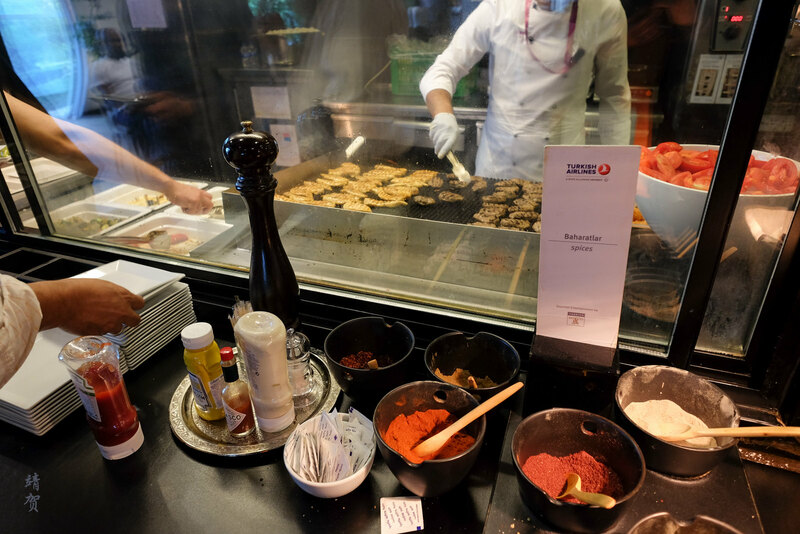 It was serving grilled meatballs and chicken fillet with a variety of spices on the sides. 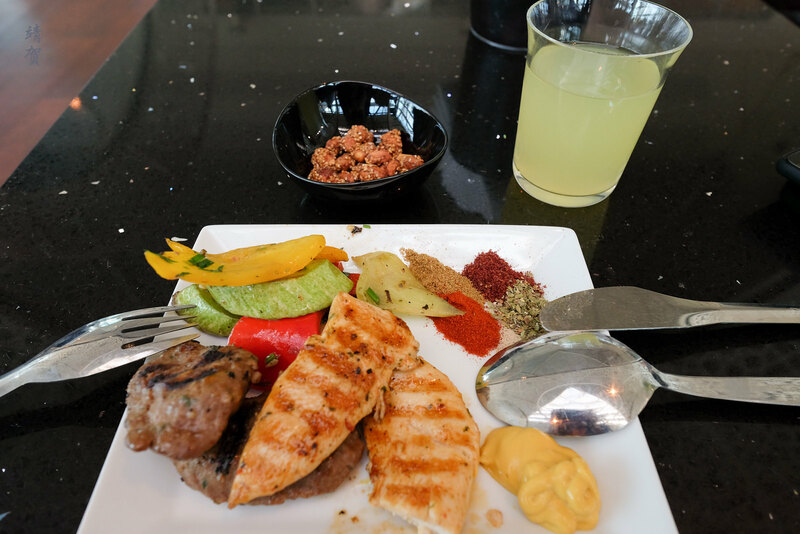 This was definitely my favourite food inside the lounge as it was very satisfying and the freshly grilled meat tasted nice with the spices. There was another dining hall situated around the grill station. For some reason the dining chair and tables here looks slightly more upmarket and would not be out of place in an upscale bistro. 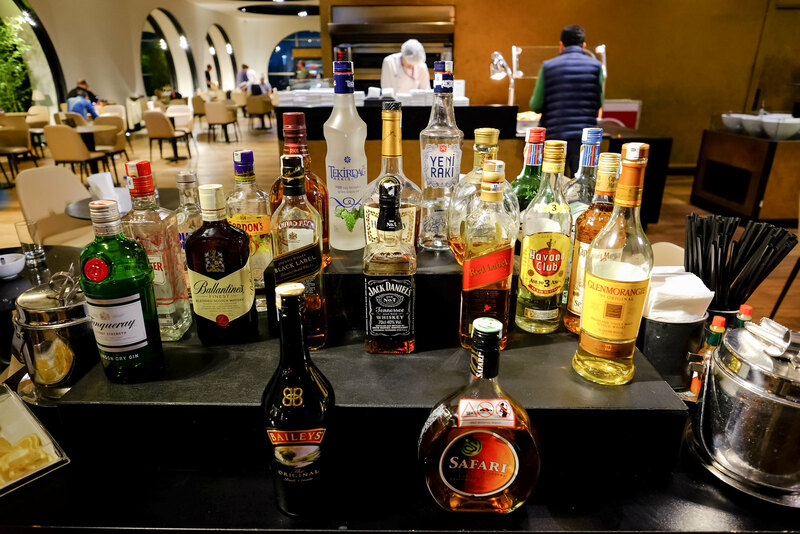 Along with the soft drinks, there was also a cart filled with a variety of liquors for passengers to pour themselves their own drink. This trolley can be found in the main floor as well. At the end of the dining hall there was the other row of luggage storage lockers beside another set of restrooms. Returning to the grill station, the left side as shown on the floor plan was more food and beverage stations. 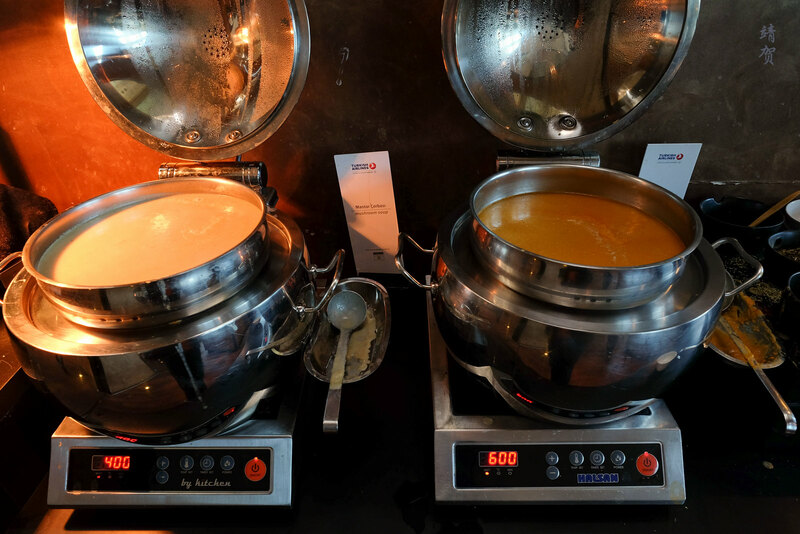 These stations serve unique dishes like homemade raviolis and a barrel dispensing a traditional yoghurt drink known locally as ‘ayran’. A mix of dining chairs and tables with the beige coloured square leather armchairs are found around this part of the lounge. 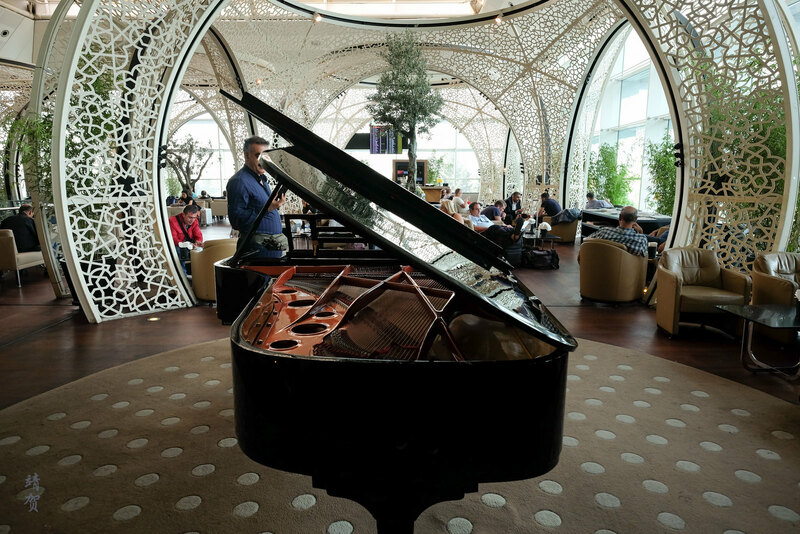 Last but not least, there was another Turkish cafe setup that connects this corner of the lounge back to the piano lounge I covered at the beginning of the lower floor. 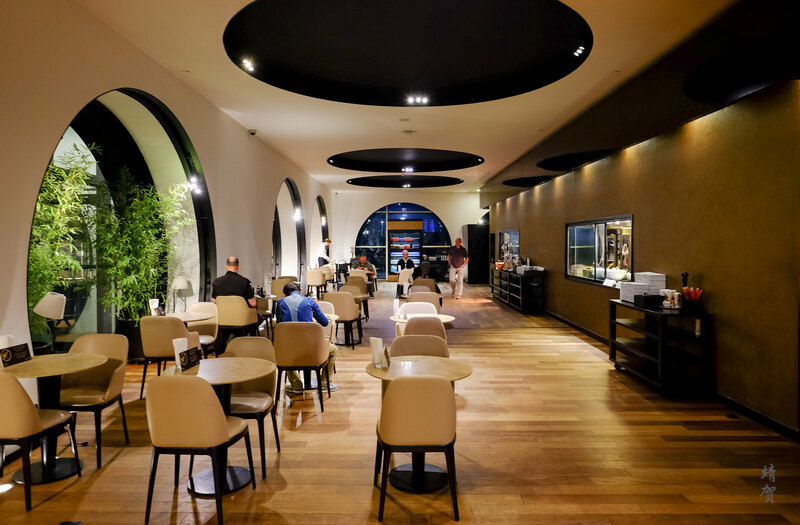 Guests could once again have specialty coffees like lattes and mochas here or indulge in Turkish coffee and tea from the stands. 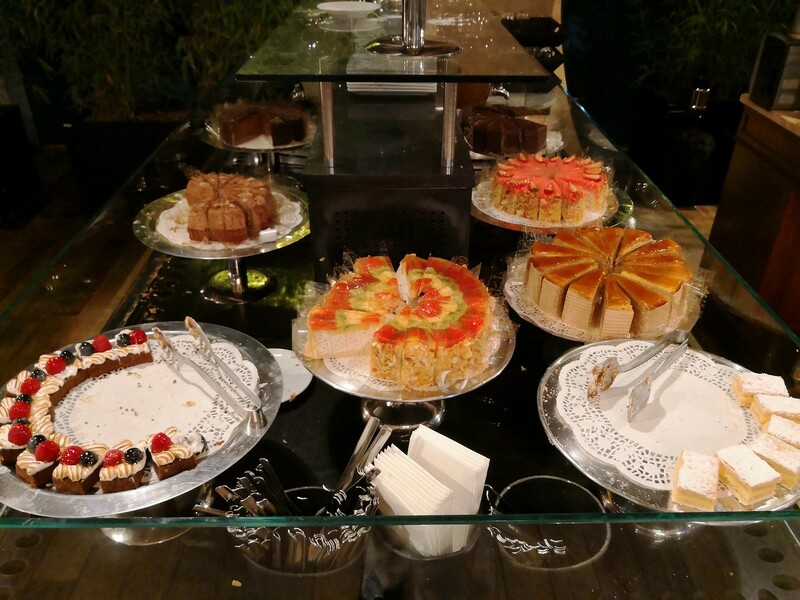 To enjoy the space fully with tea and coffee, there was a buffet island containing a nice variety of cakes. 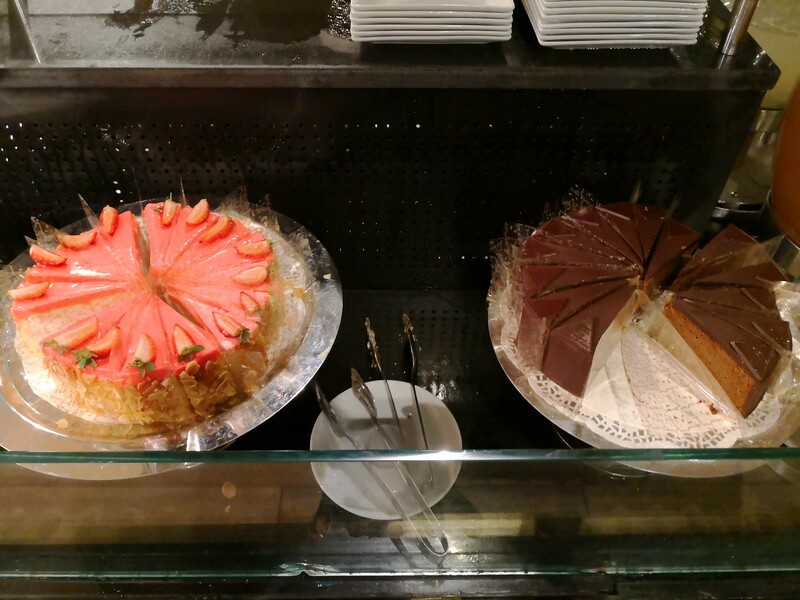 Once again the variety of cakes here was outstanding and there will be something for everyone. 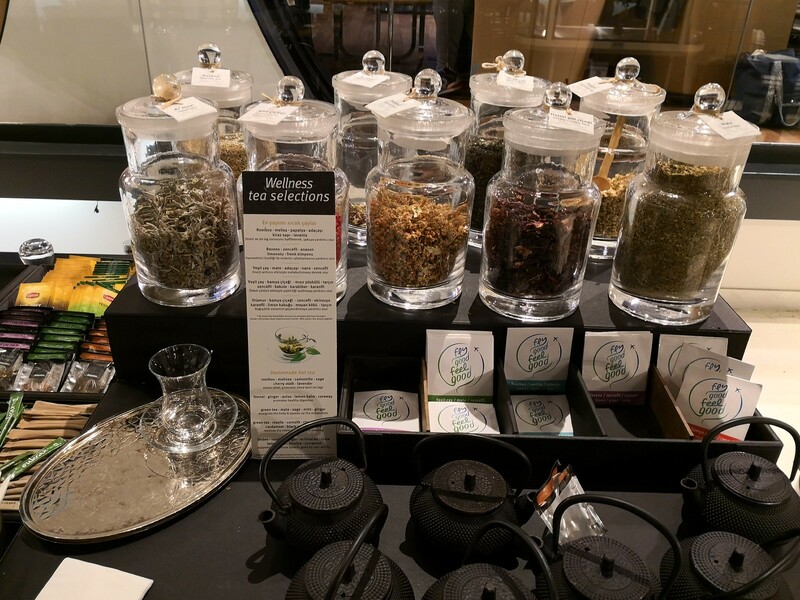 Other enjoyable drinks found inside the lounge includes a range of wellness teas found in the atrium courtyard below the staircase and sweetened ice tea and citrus based beverage from the dispensers found in the snack islands on both floors of the lounge. Between the cafe space and the piano bar, there was more appetizer stands along with more Macintosh workstations around a pillar. 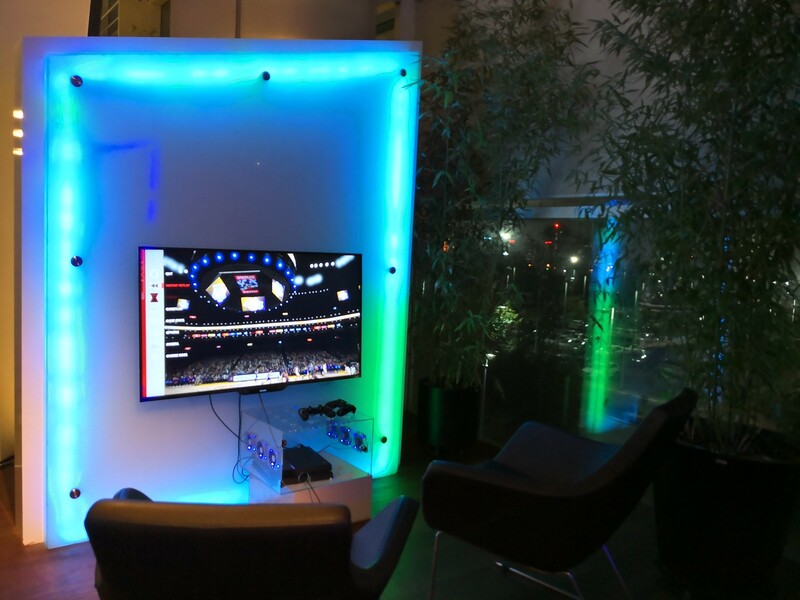 This area was basically the last space I could cover inside this lounge. From this walk through, I hope to convey a sense of how large this lounge was and I am sure many Star Alliance travelers would miss some parts of this lounge in one way or another as I do not expect Turkish Airlines to concentrate building a mega lounge in just one part of the new airport. 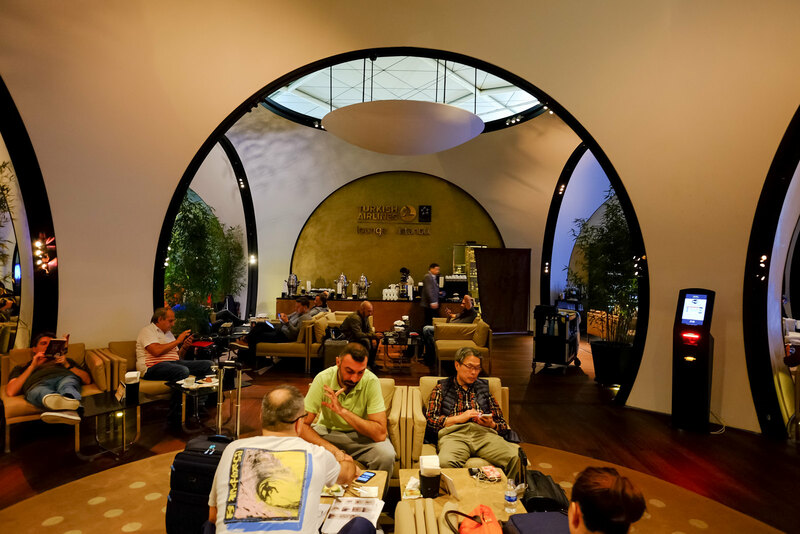 As airports becomes larger, there is a shift to building more smaller and sustainable lounges than a mega lounge like this so there might be a chance that we are unlikely to see another lounge of this magnitude and I was glad to be able to experience it before it was gone.